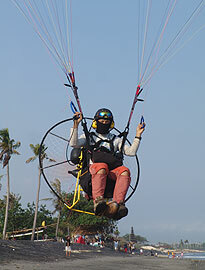 Paramotoring is the latest development in the range of foot-launched ultralight air sports. It is literally an aeroplane in the boot of the car! A small petrol engine drives a propeller, and the whole unit is strapped to your back as you fly beneath a standard paragliding wing. Not only is this minimum aviation par excellence, it is also the easiest powered aircraft you can learn to fly. Launching and landing on your feet means an all-terrain operation, without the limitations imposed by rough, wet or grazed fields when using a wheeled undercarriage. Once dismantled, the paramotor and paraglider can be transported easily - even taken on a plane to your holiday destination. Canopy design over the last few years has seen amazing progress, combining more performance with increased safety. Nowadays a typical paraglider stalls at around 5 mph with a top speed of 25 mph. The glide ratio is between 6:1 and 9:1 (a hang glider = 11:1). Sink rate is typically around 250 feet per minute. While a standard paraglider needs a hill or mountain to self launch, adding a paramotor unit enables take off to be achieved within a few paces from any suitable flat field. Unlike hill flying, the wind direction is not important and there is no minimum wind speed required. A paramotor is, however, a fair weather machine - flying in strong or gusty winds is not recommended. 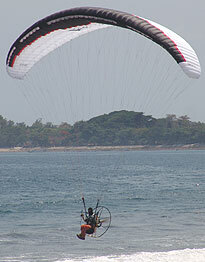 A paramotor has a fuel duration of up to 3.5 hours, making cross-country or extended local flying a possibility. Landing out near a petrol station can get you back in the air straight away! The engine can be switched off once airborne to glide gently back down to earth for a slow power-off landing. Alternatively you can use thermal lift to climb to cloud base, or soar in ridge lift in the same way that sailplanes, hang gliders and paragliders can when favorable conditions exist. An electric start allows re-starting of the engine in mid-air, extending the possibilities of this versatile motor-glider. With the paramotor disconnected, you can use your paraglider wing and harness to fly from hills or mountains, joining the thousands of people who already enjoy this unique sport throughout the world.